October 11th – a Friday, one of those perfect fall days. The air is crisp and the trees are bright as they glisten in the sun. Children are playing on the street. How can all of this be happening while my dad lies in a hospital bed in our dining room, taking what will soon be his final breaths? It is morning. He lies still; his eyes glazed and fixed – a semi-coma according to the night nurse who predicted that there will probably be no need for her to return that night. I talked to my dad and I think that he understood when I told him that he is safe, and that I sense that his mother wants to be with him, that she’s sorry that she couldn’t be there to watch her precious young son Abe grow up to become such a fine person. His eyes remain fixed, yet here is a look of recognition and knowing. He’s calmer now – he knows that even he cannot beat the forces of death. I tearily sing some of my dad’s favourite songs as one more way to say goodbye. Shakily I sing “I Love Paris In The Springtime, “Aroom Dem Fire,” and “You’re Nothing but a Nothing” – my dad’s booming voice echoing in my head. Yale, my husband, is sitting by my side sharing this tender moment. I talk to the nurse about the kind of man that my dad was – how he was so well-liked and loved, about his great sense of humour – qualities of my dad she will never know. My dad remains silent, his eyes staring into space. Nevertheless, I hear him. I hear his pride in the stories I tell about a man name ABE BRASS. I feel relieved that my dad is no longer in pain and that the worst is now over. I talk to the nurse about mundane things which surprisingly feel fine, a relief from the intensity of the week. I know that my dad is in a safe and comfortable place. I drink coffee in the kitchen, my father sleeping in the living room like a newborn baby. Yale is working downstairs. I continue to play his favourite music – both for me and for him. I look curiously at his face for signs of expression. I squeeze his hand but feel nothing in return. The replacement nurse Sharon arrives. She attempts to re-position my dad to no avail. The bedsores don’t matter anymore. My mom arrives, looking tired and scared – scared to be in the dining room and scared to be away. She putters in the kitchen. She talks to Sharon. My Dad now wears a diaper, his bowels releasing for his final journey. He no longer feels shame. Sharon puts on fresh pajamas and a pair of Yale’s Adida’s socks on my dad’s toothpick legs, replacing the thick grey cabled MacGregor socks that I had come to associate with him over the last six months. He had always loved that park. I instruct Sharon to continue playing music. I feel assured by having my friend’s cell phone. I arrive at the park, and breathe in the autumn air. I walk, rustling the carpet of leaves. On my disc player I listen to John Denver’s “On The Wings Of A Dream.” I feel sad but peaceful. I call home to check in – no change. I feel relieved and secretly expect my dad to remain in this state indefinitely. It is an okay place where his body feels no pain. I go to Dairy Queen and treat myself to a peanut buster parfait. I sit on the grass, enjoying the sweetness of the ice-cream and the saltiness of the peanuts. The fall sun shines and a gentle breeze blows. I return home, finding it difficult to enter the “house of death.” I enter the living room, saying what will be my last hello to my father. It feels very stuffy in the room – together Judy and I open the dining room window, while leaning over the dining room table fraught with medical supplies. I sit by my dad’s side. I notice him making a gulping noise. After a few seconds, it registers that this is the pre-death gulping noise that Serena, the young and dedicated night nurse, had spoken of just a few nights ago. I tell my mom who was just about to go for a walk. I call up Yale from his basement home office. The nurse verifies that his pulse is barely detectable. The time is 3:10 p.m. Nurse Sharon reluctantly leaves as the new nurse arrives. We sit with Dad, Yale stroking his forehead, while my mom and I hold his pale blue surprisingly warm hands. His lips, too, are blue. On the cassette player Vera Lynn is singing “My Son, My Son.” My brother Joel is with us too, even though miles away. My mom tells my dad one more time that he’s been a wonderful husband and father. She says to him, “You can let go Abe.” Her head is down as she weeps. I am silent as I observe each gulp. It is 3:20 p.m. and Kevin, then age 13, returns home from school. He immediately joins us in the dining room and positions himself on his grandfather’s left side, and utters, “Hi Zaida.” The music stops in mid-sentence. My mom tells my dad that we are all here. I am not certain if he hears. I watch each gulp in anticipation, tears rolling down my cheeks. Suddenly, the gulping stops and his lips close. His face looks neither peaceful nor troubled. It just “is.” My dad inhales with no noticeable exhalation – almost as if he is holding his breath. Stillness fills the air. “I think that he is dead,” I utter. The nurse checks his vital signs; we wait for a confirmation as we sit in disbelief. Then he takes one last breath inward and we no longer have to ask. His pupils roll to the right. There is no breath; there is no life. There is nothing. Judy declares my dad officially dead. The time is 3:25p.m. How could this be? How could my strong, determined dad be dead? How can the doctor’s prediction be so right? I shake uncontrollably, my body in shock. I get up. I call my brother and sister-in-law to tell them the sad, but not unexpected, news. I call the funeral home. There is commotion in the kitchen. Judy leaves and my aunt Esther naively comes in carrying a casserole. We tell her the bad news. She busies herself with my mom who is panicking. Together they make the necessary phone calls regarding picking up the body and funeral arrangements. I go back into the dining room to be with my dad for the last time. His eyes are eerily open. Nobody is able to close them. I put on one of my favourite sacred songs, “Return Again.” I touch my dad’s head, chest and ankles. With my hands I help his spirit rise. I don’t know exactly what I’m doing but I need to do it. My dad lies face up, slightly to the right. He clasps a pillow with an “ABC” pillowcase on it. His open and crossed eyes scare me. His face looks blank; I miss him already. I feel scared that he is not responding. Esther comes in and sits facing my dad, expressing how she always felt so loved by him, her older brother. She then chatters about the shiva to follow the funeral. I tell her not now. She understands and quietly leaves the room. It is just my dad and me again. I play the song with the lyrics, “How could anyone ever tell you that you’re anything less than beautiful? As I look at my dad’s lifeless body, a part of me wants to say, “Wake up, wake up – don’t leave me.” Curiously, I lift his blue fingers. They feel weightless. I stroke his still thick gray hair as a mother would a child. It feels good. I am reassured by its familiarity. I gently lift his arm and his so familiar beautiful hands. They still feel strong. I carefully study his hands, as if to imprint them in my mind forever. I notice the way gentle wisps of black hair swirl over his knuckles. I memorize each protruding vein. I recall the many packages of meat that these fingers have tied, and the numerous bridge and poker hands that they have played. I think about the many people he has warmly greeted with these hands, such strong and determined hands. I gently place his arm back on the bed. I glance at his feet and legs. Ridges from the Adida’s socks remain on his ankles. Immediately after his death, my mom lovingly suggested that we remove the socks so that “they won’t leave a mark.” As if it really matters now. I play one more song – a beautiful and spiritual one called “Life Is Eternal.” I get strength from the music and lyrics. We wait for the funeral home to come. It is now about 4:30 p.m. The van pulls up. The men come in with the gurney. Kevin kisses his Zaida farewell. They lift him from the bed, his legs now mummified in a fetal-like position. He is like a statue with my dad’s face. They cover him up in a grey blanket. They strap him in and a black cover is placed over the gurney. We all intuitively form a circle around Dad, as they head towards the front door. As they pass me, I reach for a nearby plant that had been given to my dad, and place two flowers on the black cover – one wilted and one in bloom. Yale and I sit on the front steps as they put my dad in the back of the van, and drive away forever. Neighbours console us; children are playing on the street. The bed is unassembled and the dining room returns to its normal position. Only good and bad memories remain. Leeya phones from a friend’s and enquires about her Zaida. I tell her the sad news. I go to visit her at her friend’s house. She is emotionless, curious and accepting. I drive around. I go to Foxwarren Park on the non-pedestrian side where the birds gather. The air still feels good and the breeze is comforting. I watch the seagulls spiral over the lake. Feeling somewhat embarrassed, I raise my arms in the air and tentatively ask, “Dad, if you’re out there, please give me a sign?” Just then a lone seagull swoops by me, away from the lake where it had been circling with the others. I watch as it gracefully flies towards the sun. I feel comforted. The seven month journey is now over and my dad is free at last. 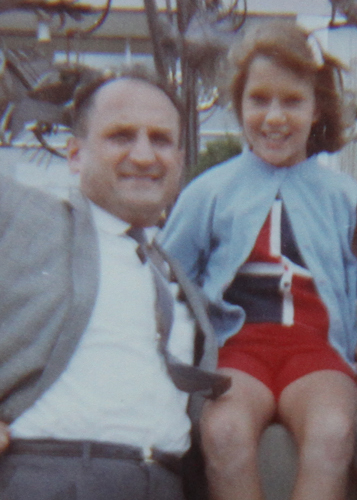 Read Part One of Diane’s story about her dad here, “I Want To Die At Home”. I could taste the salt on the peanuts — beautifully told Diane. Your story is a reminder that “all that remains is good and bad memories”. I enjoyed reading your story and I’m so happy that you have the good memory of when “the Gull flew to you”. Thanx so much for sharing your huge range of feelings about a day. a life and a deep place.